Rebecca’s latest movie comes out, which is based on an event that happened to her prior to her meeting Lupin. Lupin had just arrived in Italy and was waiting for Jigen at a sushi shop. Jigen gives Lupin a call, letting him know someone beat Lupin to his next target — Rebecca Rossellini. 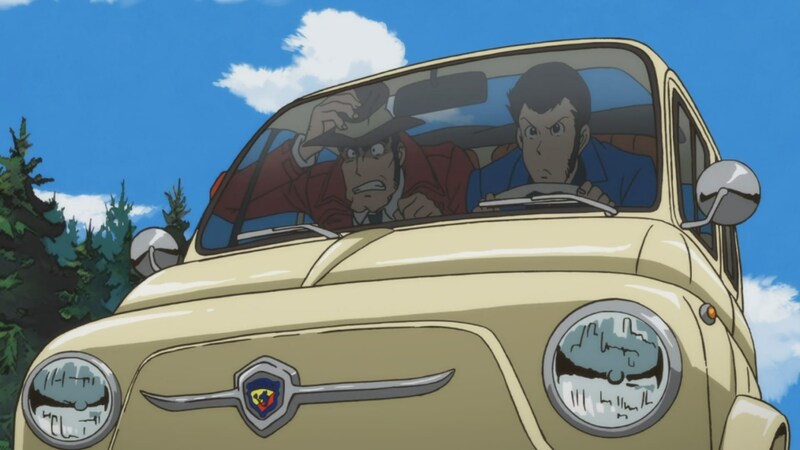 Lupin grabs his sushi tub and leaves, only to find Zenigata in his car. Zenigata snaps special handcuffs on Lupin. Lupin is annoyed by this, but he starts the car and takes off. 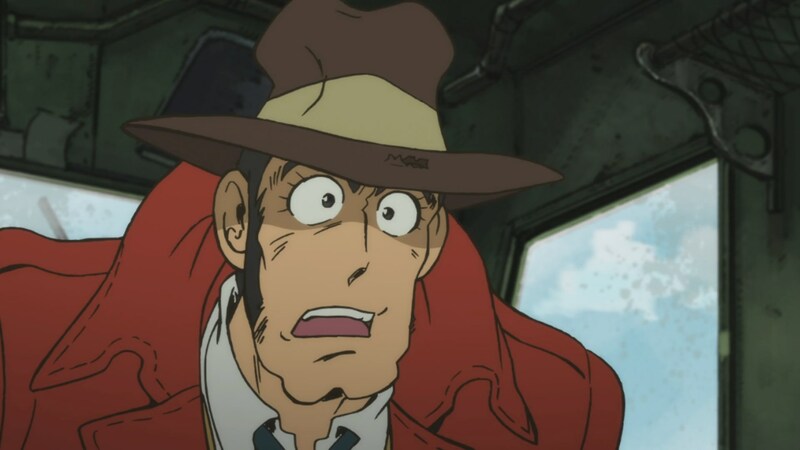 Zenigata is surprised that Lupin is attempting to save a kidnapped young lady who’s on a train. However, Zenigata wants the police who are in pursuit of the train to handle it. 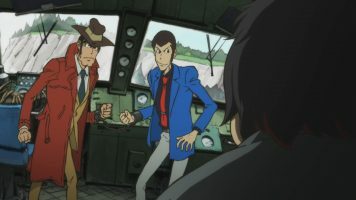 To Zenigata’s chagrin, the two police cars wreck, leaving the pursuit of the train left to he and Lupin. Meanwhile, inside the train, one of Rebecca’s obsessed (otaku-like) fans demands that she marry him or he blows up the train and they all die. Rebecca refuses, but the fan seems happy dying with Rebecca. Lupin asks Zenigata to remove the handcuffs, so Zenigata attempts to do so. However, he loses the key (and some of Lupin’s sushi) when the car hits a bump. Zenigata fails to shoot the chain, so Lupin tries. He fails as well. As such, Zenigata and Lupin have to jump together to the train. After some aborted attempts, they make it to the engine. The fan races forward to find out who came on board. He fires his gun a couple of times, which Zenigata and Lupin use to not only free themselves, but destroy the guys phone. Lupin puts on the breaks to stop the train. The train partially derails and nearly topples over and down a cliff. However, it does right itself and come to a stop. Zenigata hugs Lupin in celebration. He then attempts to arrest Lupin, only to discover he has the obsessed fan. Zenigata is unable to pursue as the local police have arrived. They arrest the obsessed fan, who demands to know why Rebecca never said she had a fiance named Lupin. This comes as news to Rebecca. Rebeca bails at the end of the showing of her movie that depicts these events. She returns to the church where she and Lupin got married. She recalls how when she met him, he gave her an envelope. Inside the envelope was a card, where Lupin promised to have her. Rebecca pulls out the card, smiles, and then leaves the church. It has taken forever, but with my watching Lupin the Third Part 4 – OVA 2, I’ve finished the series. I didn’t expect a slapstick comedy affair that makes heavy use of Lupin Physics, but that’s what I got. And a delight it was too. 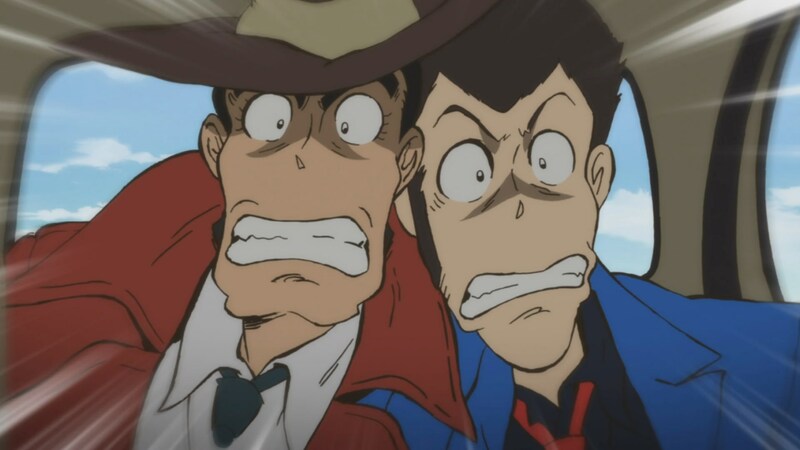 Whenever Zenigata and Lupin have an adventure together, there’s usually some level of comedic hijinks involved. Such is the case with Lupin the Third Part 4 – OVA 2 as Lupin and Zenigata are literally chained together most of the episode. The writers of this episode decided to let it all loose and just have a ton of fun. As such, all of the silly, impossibly things that happen under Lupin Physics can easily be excused in the name of slapstick comedy. For example, when Lupin finally gets his sushi order, he rushes out the door with the wooden tub (hangiri) that has his sushi order nicely presented. 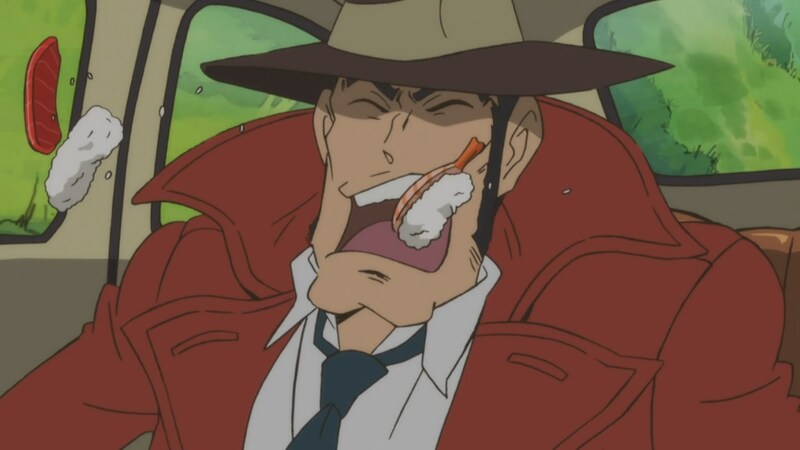 Because Zenigata has Lupin cuffed, Lupin never gets to eat his sushi. Instead, Zenigata gets to accidentally eat several pieces of it whenever the car Lupin was driving his a rock or otherwise got jarred. Even a sheep got to eat a piece of sushi. ? 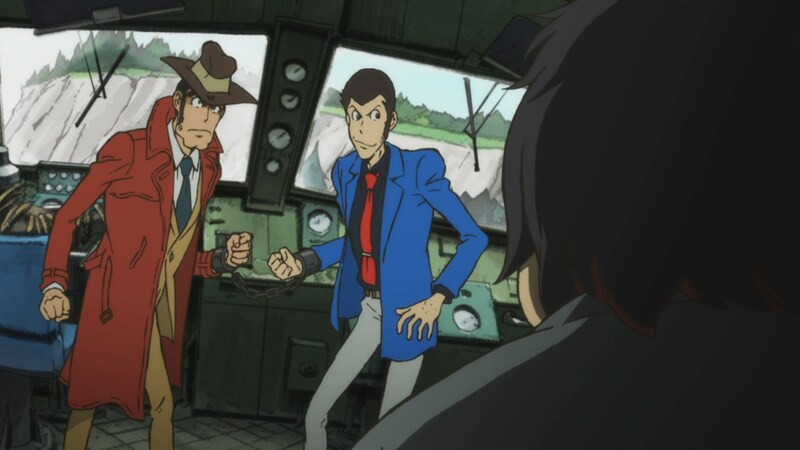 Another example of the madcap humor was Lupin and Zenigata having to free themselves from the specialized handcuffs. Zenigata’s attempts to shoot the chain of the handcuffs all failed with hilarious results. Ditto Lupin’s attempts. 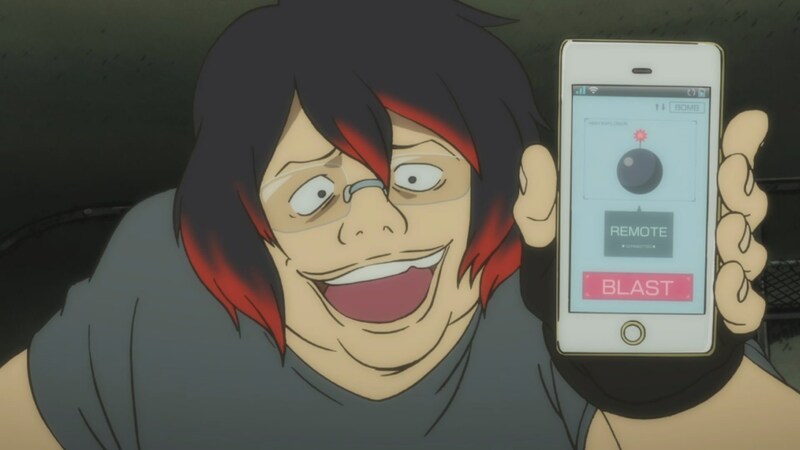 And yet when they confront the fat otaku with a gun, they manage to get the bullets to bust open the shackles and more. And finally, Zenigata with a fish, promising to make Lupin some sushi if Lupin can catch the train. It is so silly and stupid, yet I laughed out loud at the moment. ? I know this is rather short, but considering this was a fluff episode, and because it is bloody late, it is time for me to wrap up my review of Lupin the Third Part 4 – OVA 2. 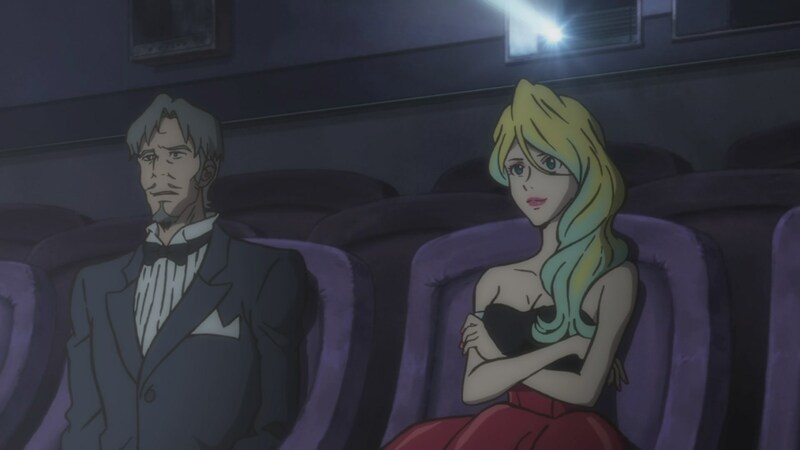 Fujiko and Goemon only receive a very brief flashback cameo. Jigen gets a little more screen time and a few lines, but that’s about all. Not surprising I guess, considering the nature of the episode. 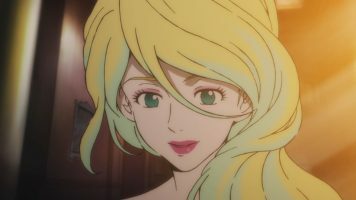 I was rather surprised that Lupin didn’t meet Rebecca on the train after he saved her. 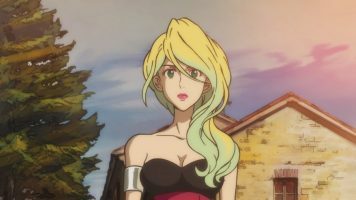 But she did learn of Lupin’s presence, and apparently shortly thereafter, Lupin introduced himself to her at the party at her house. Even though Rebecca doesn’t get a lot of screen time, her presence really makes me not miss Fujiko. No wonder I consider Rebecca a breath of fresh air for the franchise. 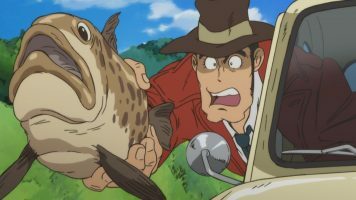 In the end, Lupin the Third Part 4 – OVA 2 is a slapstick comedy episode that ends up being a lot more fun than I expected. 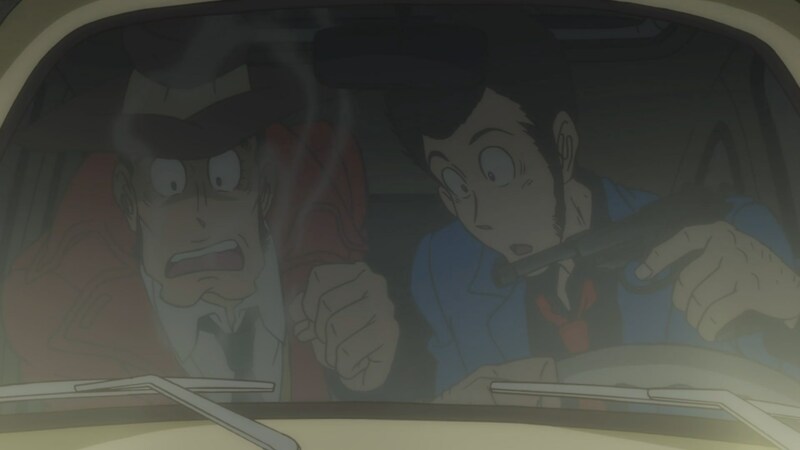 I have seen this episode in English, and I’m confused as to how Zenigata got into Lupin’s car in the first place and how Lupin was able to trade places with the fan at the last minute. I just love this episode due to the fact that part four had this as a Zenigata – Lupin episode since this franchise didn’t give us enough of those. ( And I’m not gonna lie, the humour was funny. ?) Do you know why Lupin was meeting Jigen at sushi shop? And the part where Lupin and Zenigata were hugging ? was nice since I always thought that these two characters had some sort of a father and son relationship, it’s one of the reasons that I wanted some Dad!Zenigata moments in part 6 if there would ever be one. What are your thoughts on what everything I just said/wrote? I’m confused as to how Zenigata got into Lupin’s car in the first place and how Lupin was able to trade places with the fan at the last minute. That’s part of the Lupin Physics. Basically, this is when Lupin or others do things that are impossible to do without any explanation as to how they actually did it. And I’m not gonna lie, the humour was funny. Do you know why Lupin was meeting Jigen at sushi shop? 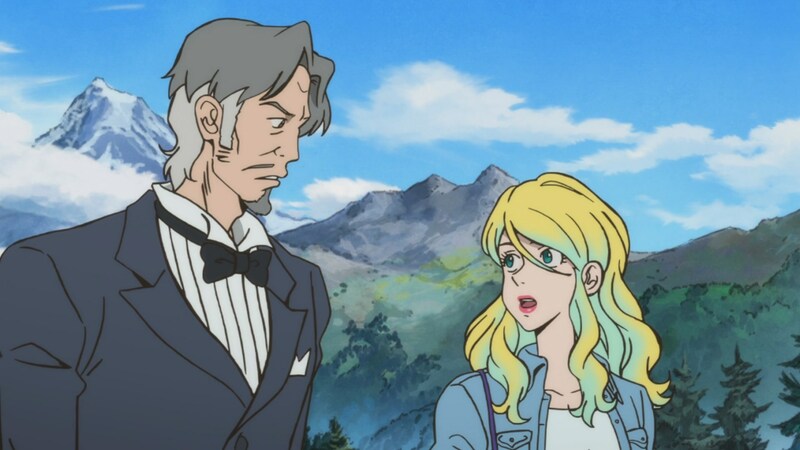 Since the story of the episode is a prequel to episode 1, it sounded like Lupin had just arrived in country and wanted to eat sushi with Jigen. What about everything I said about the part where Lupin and Zenigata were hugging 🤗 ? What are your thoughts on that?